RIGHT from the moment we met her, we could tell she was a party girl. We had spotted her standing on her own at first, throwing streamers into the boisterous crowd of passengers at the Sailaway Party. But as we downed our second glass of champagne, we struck up a conversation with the diminutive single-berth passenger that meandered from curiosity about our location on West Australia's south coast, to her hometown of Melbourne, finally settling on AFL football and her link through marriage to North Melbourne legend Wayne Schimmelbusch. Although she had a few miles under her belt, she certainly looked good for her age. In fact, she had a real sparkle – a welcoming glow and sense of fun that put everyone at ease. Soon she had a circle of newfound friends around her. And after five days of bumping into her at the Muses Nightclub on the first evening, dressed as a hippie in the Calypso Show Lounge audience at the Memories of Woodstock night, listening to the dulcet tones of the cabaret singers over cocktails, shaking a tail feather to the rock'n'roll classics, or simply taking it easy in the fresh air off the stern, we reckoned she'd got her money's worth from her holiday. Looking back, she wasn't just indicative of the feel-good nature of the 500 passengers onboard Classic International Cruises' Athena on our Summer Nights adventure. She personified the ship. This grand old lady of the seas is one of the oldest passenger vessels operating in the world today but after being renamed and reborn several times in new guises and a complete refit in 2004, Athena has plenty of life in her yet. Built for comfort, not for speed, she came on to the cruising scene in 1948 as Stockholm – the smallest passenger liner in the North Atlantic, as part of the Swedish-American Line fleet. Named after the Goddess of Wisdom, Athena still appears more yacht-like than liner with a cruiser stern, crisp white and blue paintwork, and a raked bow. After surviving a collision in dense fog in 1956, she was repaired and returned to service but, like countless other liners of the era, found herself in long periods of lay-ups due to the growth in popularity of air travel. A succession of names and owners followed, but a rebuild in the mid-‘90s, at a cost of $US150million, saw her later bought by Festival Cruises as Caribe. At the age of 40, and following the collapse of that cruise company, she could have been destined for the ship graveyard. But after being acquired by Arcadia Shipping, she underwent a major refit in 2004 to emerge as the stylish Athena in April 2005. Over the past six years, she has faithfully provided luxury cruising holidays for passengers all over the world – from Scandinavia and Greenland to the Mediterranean, Canada to North Africa, plus a tour around the world in 120 days. And Australians have welcomed Athena with open arms during her summer cruising seasons Down Under. More than 50,000 Australians have now sailed with Classic International Cruises from Athena's home ports in WA since the line started offering round-trip cruises from Perth in 2004. CIC managing director Grant Hunter says Athena's popularity is due to the fact that, unlike bigger and newer ships with their “distractions”, Athena offers a return to traditional ocean cruising with personal old-fashioned service, fine cuisine and a relaxed atmosphere. Athena proves that the simple things in life are often the best. It seems that, just like our cruisey Summer Nights friend, this refined old gal is forever young. The writer was a guest of Classic International Cruises. Athena cruises from Perth and Adelaide next summer from $450 pp for two nights. A five-night cruise next summer from Perth to Albany and Esperance is priced from $1095 per person, twin-share. Children under-18 travel free on several cruises, paying only taxes. Book through travel agents. For more information, see www.classicintcruises.com or phone (02) 9908 7877. Athena has 276 cabins, including 42 suites on eight passenger decks and can take a maximum of 600 guests. Eight of the top suites have private balconies and jacuzzis. The 2011-2012 cruising season – with 15 cruises lasting from two to 40 nights – will be CIC's eighth successive summer cruising season in Australia and the longest ever here, extending more than six months from November 15, 2011, to May 24, 2012. 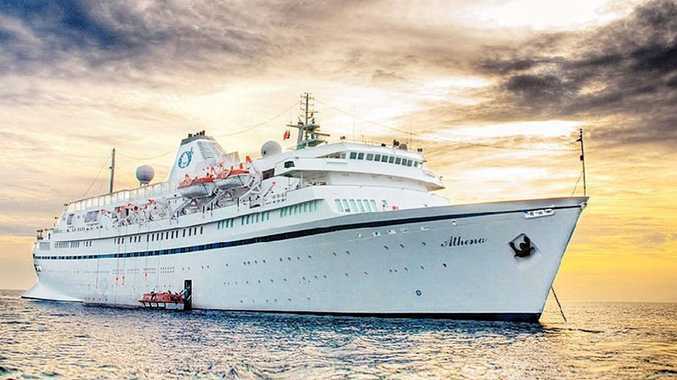 Calls to Sydney, Darwin, Japan and South Africa are among a season of firsts for Athena during the new program, which includes a return to cruises from Adelaide as well as from Fremantle and Perth.